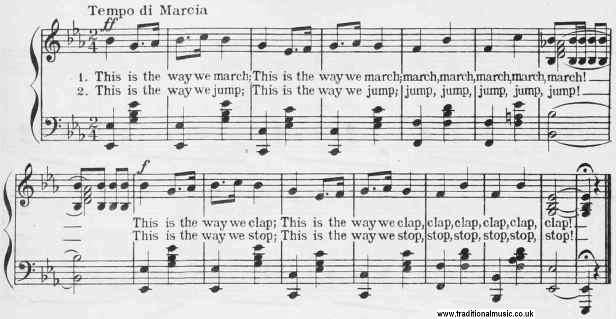 The children can be arranged for this song in broad rows, if the room is long enough to admit of the twentyfour paces required by one verse, to be done without turning; in this case they will simply right�about-face to begin the second verse, and jump and march back, letting the word stop, at the end of the third line, bring them back to the place from which they started. In ordinary rooms the best way is to place one child in front of another, letting them move round and round the room in Indian File. Indeed in a large room it is a very pretty change from the row, to let the children change to Indian File, by turning half round after "mark time, stop!" and beginning the song over again in this position. The children form a circle, with one or more in the centre; those in the circle dance around those in the centre, singing the first verse: then they stand still while those in the centre sing the second verse, afterward choos�ing others to join them in the centre, and continuing to ask the question, until all have been chosen, and they all sing together," We all of us know the Muffin Man" etc.